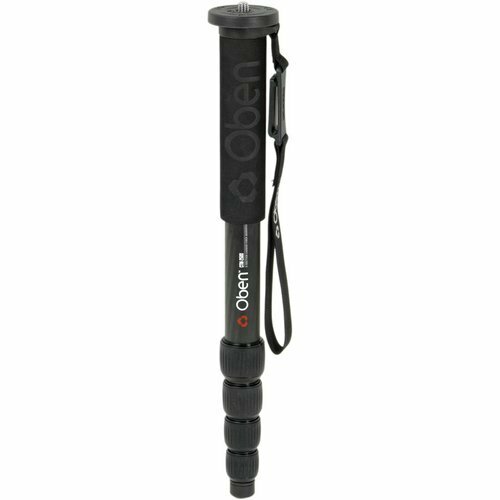 The Oben CTM-2500 5-Section Carbon Fiber Monopod is an extremely lightweight yet sturdy one-legged camera support that enables you to capture steady shots without needing to carry or set up a full tripod. The monopod has an anti-rotation shaft, so its twist locks can be disengaged all at once to deploy each leg stage instantly, making setup a breeze. Maximum height is 65", which facilitates comfortable operation for almost all users. The CTM-2500 is composed of 6x carbon fiber to achieve its light weight, while ensuring its stability. It can bear loads up to 26 lb, so you can mount any DSLR camera with almost any lens, a point & shoot model, or even a full-sized camcorder. The five-section monopod collapses to just 17.3", so you can stow it in almost any carry-on bag. At only 1.05 lb, it's the perfect travel companion - lightweight, compact, and simple to operate - but highly capable and ready in an instant to help you capture the perfect shot. If you have any questions about this product by Oben, contact us by completing and submitting the form below. If you are looking for a specif part number, please include it with your message.